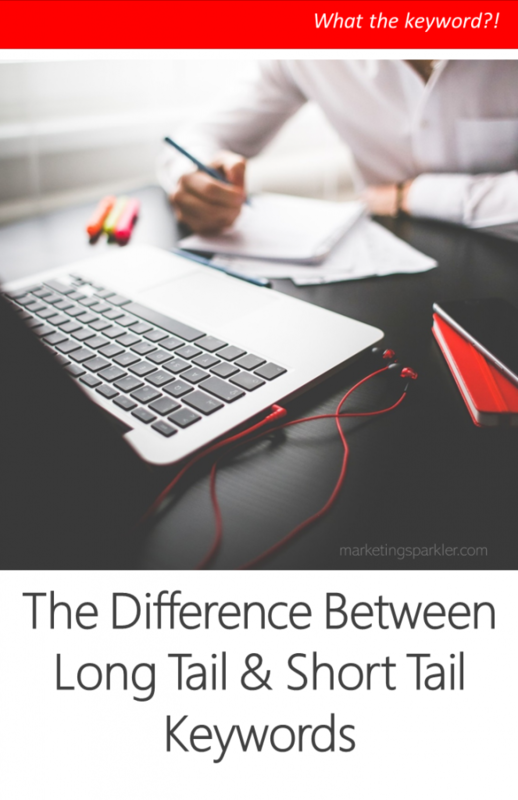 What do tails have to do with blogging? As it turns out, quite a bit! Long tail keywords, an important buzzword in marketing that many non-marketing people don’t understand. The term “Long Tail” was initially coined in 2004 by Chris Anderson in an article in Wired magazine. It was initially used to describe the niche business strategy that is used by companies like Amazon. So, what’s the difference between short tail keywords and long tail keywords? Short tail keywords are anywhere from one to three words, and they target a mass audience. Long tail keywords are anywhere from three to five words or more, that target a specific search criteria. A person that performs a long tail keyword search is looking for a very specific item. If you use a long tail keyword for a blog post, sales page, website, etc., you will naturally target a smaller audience. Long tail keywords are at least 3 words and target a specific search criteria. At first glance, you may think targeting a mass audience is a great thing. After all, you want as many people as possible to find your website when they’re performing a search. However, the key to getting found is to rank high on the Search Engine Results Page (SERP). You know, the first page. Marketers like myself describe the phenomenon that “long tail keywords” could get more traffic combined than the broader, more general keywords. Let’s look at a couple examples. Let’s say the keyword “dog training” gets approximately 2,420 searches per day. Then you start looking at long tail keyword phrases for that niche – dog training collars, dog potty training, dog training careers, and so on. When you add up all of the long tail keywords, which are easier to dominate in the Google SERPs, it equals more traffic than if you simply went after dog training. Suppose there are 10,000,000 websites competing for the term “dog training,” but only 361,000 competing for “dog training DVD.” If you are selling a dog training DVD, you have a far greater chance of reaching the first page by going for dog training DVD, than you would if you were competing against 10 million pages. Being ranked number one for a broad term like “mp3” would probably take a highly experienced SEO expert many months of hard work. This is on top of a very large budget for gaining backlinks as well. However, ranking for a term like “1970s rock mp3s” might be much easier – because it’s a long tail. If the term gets 50 searches per day, and you rank number three, then you might get 20 or 30 hits to your website per day. If you rank number 30,714 for the term “mp3,” you won’t get any traffic from that at all. #SEOTips The person who gets more specific with their searches is usually ready to buy. Specific long tail keyword searches generate targeted leads. Consumers tend to type in long tail keyword phrases whenever they’re in a buying mood. Think about how you search when you’re serious and/or looking to buy. For example, let’s say you sell golf clubs and equipment. Would you rather get traffic from people searching the word “golf” or from someone who types Taylor Made R580XD Titanium Driver” into Google? The person who types this specific phrase into Google is likely looking to buy. The person who gets more specific with their searches is usually someone who’s ready to buy – someone who knows what they want. The person typing in golf may want to learn golf history for a project. Or, they might want to take a golf vacation. Or perhaps, they’re interested in attending a local tournament. That won’t do you any good if your site sells golf clubs, but the long tail phrase will cater to that crowd. Finding good long tail keywords is very important, because you need those phrases to bring in traffic. Some marketers shun long tail keywords, believing they have to rank well for the prime keyword phrases. Other folks are using a long tail keyword strategy to reach a demographic that has money in hand. Pick your long tail keywords and phrases carefully. Separate your broad, generic terms (short tail keywords) from your long-tail phrases. Then, you can monitor your Google search results page positioning to see how your keyword list is performing for you. So, how much time do you spend searching keywords? Great post. I just started teaching myself about long-tail keywords and using the keyword planner. Thanks for the great examples. It really helps!